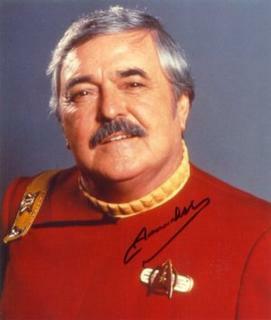 So I find myself even sadder this morning upon reading the news that James Doohan, Star Trek’s Scotty, passed away this morning. I’m a Star Trek geek, I’ll admit it, I’m not ashamed. It was a nice coincidence to be reminded of Scotty just a day before his passing. I got the news too and it is sad. He played a very good character in Star Trek, I still remember the hilarious scene with McCoy in Star Trek: The Voyage Home. It looks like “someone” or “something” beam him up this time. A few years ago, I was in line behind Scotty at the Safeway in Redmond. When it was my turn, the cashier asked if I had recognized him and said he came in all the time. When I got to the parking lot, he was loading his bags into his minivan/shuttlecraft. I thought about asking for his autograph but didn’t want to bother him. It was just cool to actually see him in person.